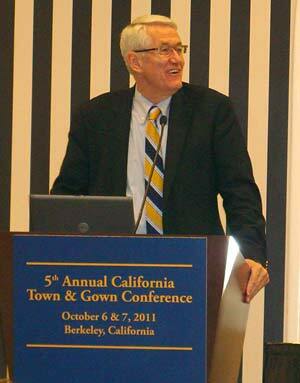 Though he acknowledged “some bumps along the road” during a Friday breakfast session, Berkeley Mayor Tom Bates praised UC Berkeley’s contributions to the local economy and declared himself “extraordinarily proud” of his city’s increasingly close partnership with the campus. Seated beside him on the dais was Berkeley Chancellor Robert Birgeneau, who seemed no less eager to put bygones behind him and focus on the journey ahead. Bates and Birgeneau were among the officials representing “town” and “gown” at the fifth annual Town and Gown Conference, a two-day meeting of minds from the fields of government, education and business in the ballroom of downtown Berkeley’s Hotel Shattuck Plaza. Day 1, on Thursday, featured keynotes by Lt. Gov. Gavin Newsom, the former San Francisco mayor and current UC regent, and author and climate-change activist Mark Hertsgaard. Highlights of Friday’s session were a panel discussion anchored by Bates and Birgeneau, and a talk by former Labor Secretary Robert Reich, an economist and professor of public policy at Berkeley. This year’s theme was “Working Together in Tough Times,” and the participants — including, on Friday’s panel, San Francisco State University President Robert Corrigan and Palo Alto Mayor Sid Espinosa, who compared and contrasted their own respective town-gown relationships — appeared to be all in. “Research universities like UC Berkeley spawn new products, technologies and new industries that benefit every Californian,” Newsom said. “The University of California has not only helped build new industries in this state, it supplies the educated workforce these industries depend on to compete in the global economy.